Giving this thread a quick bump! Any of you guys up for another team challenge for this upcoming week, or nah? I kind of feel like spicing things up a bit, and make this a bit more fun for everyone. I know this is kind of a short notice for everyone here, but I could whip up a quick spreadsheet, and using the Google Forms to input members picks. What I'm thinking of doing here is making this into a free for all bracket, since we have 8 total "active" participants. I'd group the teams into 2 each. Here's how I would come up with the groupings of the teams. Using our current 2019 daily stock picking members leaderboard, I'd group the teams like they do in a professional sports playoff format. Where the best team plays the worst in the standings. Well, in this case it would be #1 and #8 grouped as TEAM #1; #2 and #7 grouped as TEAM #2 and so on and so forth... Does this make sense? I've actually already generated the spreadsheet and forms, but I just want to get everyone's quick input to see who would be interested to take part in this challenge this week. So, taking the daily stock picking members leaderboard standings, this is how I would be doing the grouping of the teams for this team challenge. If you're wondering why I've crossed out @bronk, that's because he seems to be AWOL at the moment and has not been actively participating on these competitions. We want to have "active" participants for this team challenge for this week. Also, if you're wondering why I've left myself out of this team comp, it's because we would then end up with an "odd" # of participants (9). In order to to make this an even # I'll just sit this one out and will be the organizer for this contest this week if you will. With that all being said, here is the spreadsheet and the individual team form button links that I have created for everyone to submit. The "rules" are exactly the same as our regular daily picking contests. Also, I know this will probably get brought up in here at some point as well, but in the event of a "no-pick" day from any one participant, we would just simply do a "repeat pick" for that participant the next day. In other words -- we'll use the same pick from the prior day to the next day for anyone who fails to submit their pick for the next day. I know this is a lot to chew on right now, so I'll just leave it at that for now. If you guys have any questions feel free to fire away. Anyway, without getting into further ado here I present to you guys the button links for this trial run of the team challenge for this week. <-- click there to view the main spreadsheet! <-- @Lico Inv and @Stoch click there to submit your daily pick for Monday! <-- @rStock and @stock1234 click there to submit your daily pick for Monday! <-- @snuffalchewy and @Three Eyes click there to submit your daily pick for Monday! <-- @emmett kelly and @Steven_Burt click there to submit your daily pick for Monday! <-- click there to view the bracket! In case this week does not work out due to the "short notice" we can always try this for next week as well. What I'll have to do is post this in the main threads to get everyone's attention. This was a super short notice here this weekend, and it's very possible not everyone will see this thread today. Anyway, this is just an idea for another competition for participants to take part in. I can also try this on a "weekly" format as well, in case the "daily" format is just too far excessive for everyone. Hmm, on second thought, maybe I should be grouping the teams into 3 each, instead of 2? Then we can have an odd # of participants for each team, which then will allow for me to participate as well. So there would be 3 teams, instead of 4. I think I'll do this on a "weekly" format though, as the daily can be a bit a little too much? Thoughts? Alright, so I just redid the whole thing here and will instead run this on a "weekly" format instead of "daily", since I think doing this on a daily might just be a tad bit too excessive for us for right now. We can still try this out on a daily format too, but I'll wait until another week to run that. And here are the button links for the spreadsheet and forms below. <-- click there to submit your weekly picks for this week! Let me know what you guys think of this idea for now. It's possible that we may not be able to run this for this week since I didn't really give much of a head notice to all of our participants. I'll need to have this posted on the main threads first to get everyone's attention, then run it the following week. But, nevertheless I've got all the links posted there above if you guys wanna test run this for this week. Just found this. Cool idea. Just a quick heads up here. Since a couple of participants did not submit their picks via the form links on Post #36 here, instead of just completely calling off this test run, what I simply did was just copy the missing participants picks from our regular weekly picking comp to here, this way we don't have empty fields in the individual team sheets. Hopefully this will be okay with the participants listed below who did not submit picks for this team challenge. If not let me know. ^^ These are the participants who did not submit their picks here via the form links, so I just copied their weekly picks to here. Anyway, this test run of the weekly stock picking team challenge is all set to go for this week. I probably should have created a fresh new thread for this, but too late now. I'll do that for my next attempt. BTW, I guess I did not make myself very clear on how this weekly stock picking team challenge will work. Individual picks can be closed out at any time, just like our other contest formats, however they would need to be posted to this thread here. Also, I think I did not mention this while I was putting this all together yesterday, but the way this team challenge will ultimately work is that whichever team ends up the week with the highest collective total combined team return wins this weekly comp. It's not a best of 5 series or anything. Just a free for all. Which basically means whoever wins this week is the winner. On my next attempt I'll run this more properly and do a best of 5 weekly series or something. 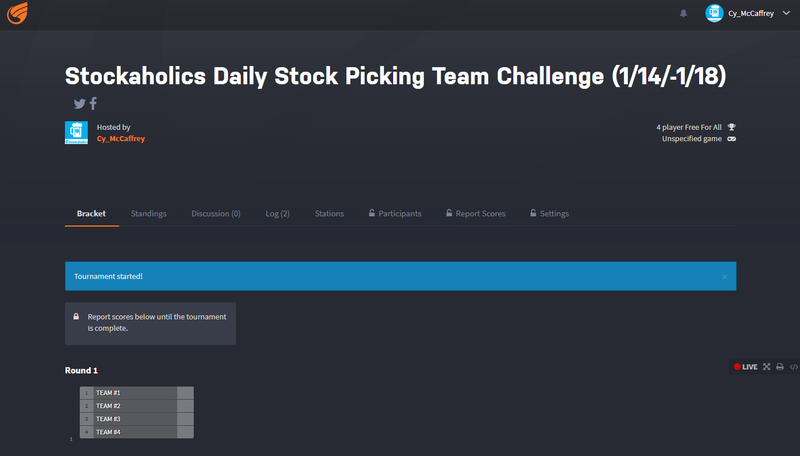 Since today was our very first day of this trial run of the weekly stock picking team challenge on Stockaholics, I figured we could have a quick post update to kick off this team challenge for this week. Shout out to our current team leader -- TEAM #2! ^^ Looks like that just might seal the deal for Team #2 on this week's team challenge trial run haha. Great pick there for this week @Three Eyes! Congratulations to this week's Stockaholics Weekly Stock Picking Team Challenge for the Week of (1/14-1/18) -- TEAM #2! Thank for playing y'alls! I'll try to have a more organized team challenge with a playoff format going in a couple of weeks. I realize this week's challenge was kind of done on a very short notice for a few of you. My bad! Glad that we still got to test it out this week.